In late March and early April, flash floods killed dozens of people in southern Iran. The worst rains in at least a decade ravaged 20 of Iran's 31 provinces. At least 25,000 homes were destroyed, and another 60,000 were damaged. 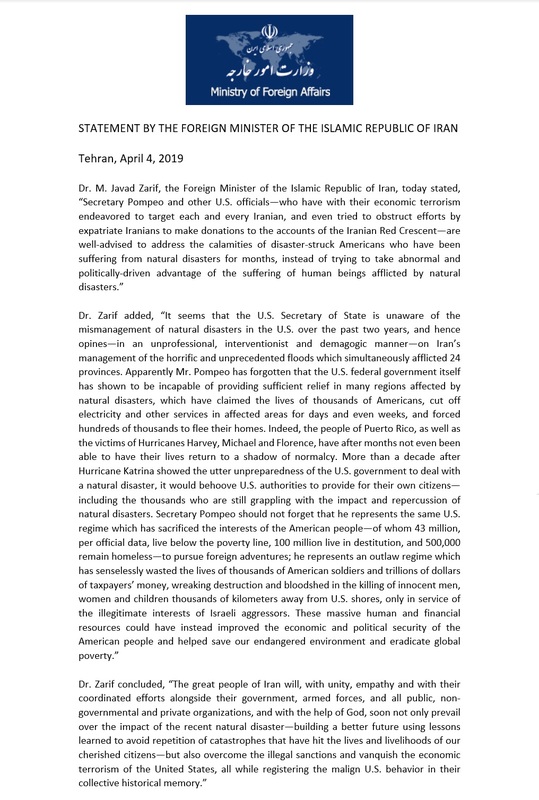 On April 2, U.S. Secretary of State Mike Pompeo issued a statement that sympathized with the victims but also blasted Iran's government for mismanagement and its poor treatment of environmentalists. Zarif was referring to comments by Ali Asghar Peyvandi, the head of the Iranian Red Crescent Society. “Prior to the [reimposition of U.S.] sanctions, we had some Red Crescent accounts connected to SWIFT, and we sought international aid through them. However, at present, these accounts have been sanctioned and there is no possibility for money transfers from other countries,” he said on March 30. On April 4, Zarif followed up with lengthier statement condemning Pompeo's remarks. Many parts of Iran are susceptible to flooding due to a decades-long drought, which has left the soil unable to absorb much water. But the latest floods were also attributed to poor urban planning and inadequate safety measures. Buildings and roads were constructed too close to rivers. The floods have caused especially heavy damage to agriculture. The chief of the agriculture ministry’s crisis manage department, Seyyed Mohammad Mousavi, estimated losses at some $180 million for March. On April 2, authorities ordered the evacuation of more than 70 villages in oil-rich Khuzestan. The provincial governor, Gholamreza Shariati, warned than dams were already 95 percent full. "With the possibility of dams overflowing, we have made preparations to accommodate 100,000 people," Peyvandi told state television.